So you did our Avengers Tweetwatches, you saw the movie, and you just can't get enough of superheroes! Plus, you're looking forward to the Pixar summer movie, Brave. 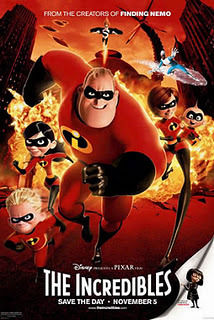 So why not join the fun tonight with THE INCREDIBLES Tweetwatch. Mark Andrews, the director of Brave, was story supervisor for The Incredibles, so it's time to see his earlier work. 1. Get the DVD or Bluray so you can watch with us. Netflix, Redbox, whatever you need to do. 2. Tonight at a little before 8:30, head over to our Friendfeed room. 4. At 8:30p ET, I'll tweet out the signal to push play, and we'll watch the movie together, while I fill you in on some of the little known facts about each film. And while you're getting ready for the Tweetwatch, you need to make sure that you are planning for our very first Disney Film Project meet! That's right, all four of us will be at Walt Disney World on Saturday, May 19, and you can join us to go see Avengers at Downtown Disney. Check out all the details here on Plancast and book your trip now. It's the first weekend of Star Wars Weekends as well, so you don't want to miss this!